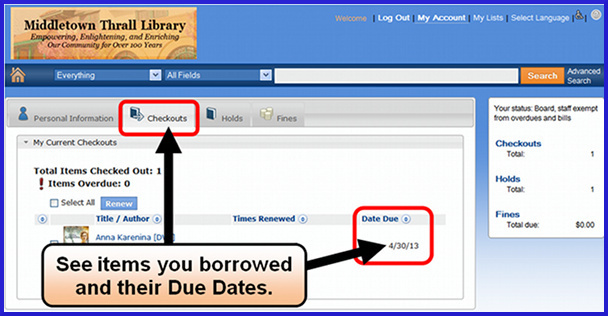 You can review due dates for borrowed items, the status of requested items (holds), and library fines (if any) by logging into the online catalog. After you click on Your Library Account, you will be asked to enter your library barcode number (without any spaces) and your PIN (usually the last four digits of your telephone number). 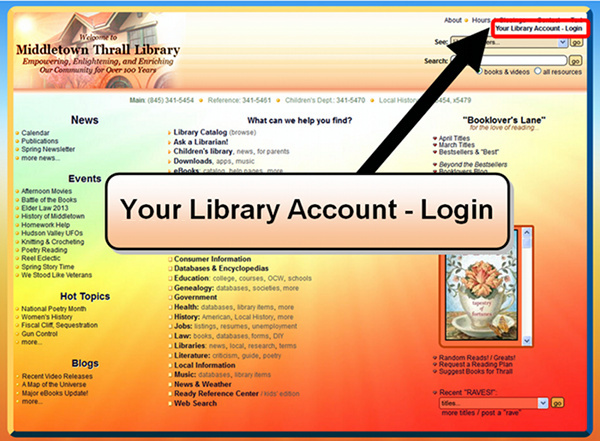 Once you click the "Log In" button, your library account page should soon appear. If you notice any item is due soon - or overdue (kept beyond its due date) - please return it as soon as possible to avoid or minimize any possible overdue fines. You might be able to "renew" an item to extend its due date. Please click here to learn more about renewing items.